Apply the hands on Science of Energy, Motion, and Friction. 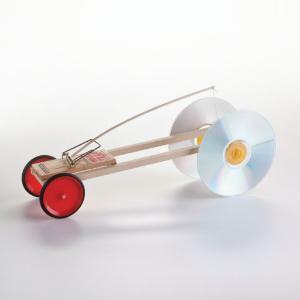 With this STEM-based project kit that meets Next Generation Science Standards (NGSS), students will design and build cutting edge vehicles to investigate stored energy from sources such as a rubber bands or mousetraps. The kit components include wood chassis, mousetraps, braking systems, and several types of wheels and gears. This allows students to develop a greater number of solutions and apply real-world problem solving skills to create innovative designs. Students can create and innovate to determine which designs allow the racer to go the farthest or fastest on an incline, and identify which designs best pull loads or easily handle obstacles. Each kit includes components for up to eight students. The Accessory Kit (sold separately) is available to explore solar and electrical power as alternative sources.